Constructed from durable aspen wood traditional adirondack design sculpted seat keeps tots in correct position. Sliding tray offers additional security and seat belt keeps child secure. Zip tie locks the rope around a limb or hook. Recommended for children 35 lbs. 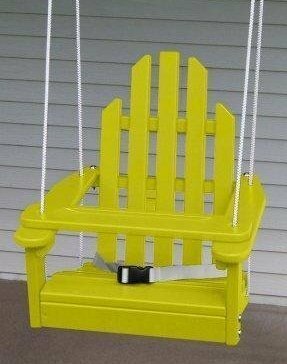 and less Childrens Adirondack Swing is designed for children 1-4 years of age For added strength - glue, bolts, screws, and dowel construction Easy to maintain - clean with soap and water Paint and been tested and complies with section 102 Consumer Products Safety Improvement Act. Rope instead of chain prevents catching. Made in the USA. Requires minor assembly. Seat belt included, ten foot rope included.